Cereal stored in Dhubab, Taiz Gobernorate, in Yemen. The World Food Programme (WFP) gained access for the first time in five months to the large Red Sea Mills grain silo in Hudaydah, on 27 February. The first assessment of a major UN aid storage facility in war-torn Yemen has been carried out since it was cut off by fighting last September, the Organization reported on Wednesday, hailing it as “a great first step”. Briefing journalists in Geneva, the World Food Programme (WFP) confirmed that a team had reached the Red Sea Mills near the key port of Hudaydah on Tuesday. It has appealed for sustained access to the site, which contains enough wheat to feed 3.7 million people for a month. “The silos show evidence of damage by the fighting, but no apparent structural damage except the silo affected by a hit in late January, which basically resulted in serious fire damage to that specific silo,” said senior Spokesperson Hervé Verhoosel. “We have now a first assessment, we’ll probably need additional technical assessments,” he added. In addition to fire damage to one silo, the assessment team found evidence of weevil infestation, but no water infiltration. “Tuesday’s visit was a great first step,” Mr. Verhoosel said, noting that Yemen imports around 70 per cent of its daily food, fuel and medicines via Hudaydah port, which has been the focus of clashes between Government forces and Houthi opposition fighters, although a UN-backed ceasefire and troop-withdrawal negotiations are on-going. Samples of the grain have been sent for testing to check whether it is still edible. If so, the 51,000 tonnes of wheat can be processed at the facility, where equipment is largely untouched and the generators “appear to be in good condition”, Mr. Verhoosel said, adding that more than 30,000 litres of diesel was still available. The positive development is dependent on continued access being granted by the warring parties, who signed a UN-led partial ceasefire agreement in Sweden last December. It follows a UN-led appeal for more than $4 billion from international donors this year, to save millions in Yemen from starvation. 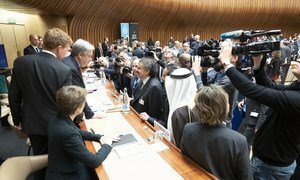 At the pledging conference in Geneva on Tuesday, when $2.6 billion was promised, UN Secretary-General António Guterres warned of an “overwhelming humanitarian calamity”, as a result of almost four years of fighting between supporters of Yemeni President Abd Rabbu Mansour Hadi and Houthi opposition groups. Some 360,000 children are now suffering from severe acute malnutrition, Mr. Guterres said, before citing one credible report that more than 80,000 children under-five have died of starvation. Echoing the dire needs in Yemen, WFP’s Hervé Verhoosel expressed hope that UN-led efforts to secure a political solution to the conflict proved successful. Donors have pledged $2.6 billion to provide urgently needed support to millions of Yemeni civilians facing an “overwhelming humanitarian calamity” after nearly four years of brutal war, UN Secretary-General António Guterres said on Tuesday. Four years of “mind-boggling violence” in Yemen “has not spared a single child”, a top UN Children’s Fund (UNICEF) official said on Monday, on the eve of a pledging conference in Geneva to help alleviate the suffering of millions across the country.